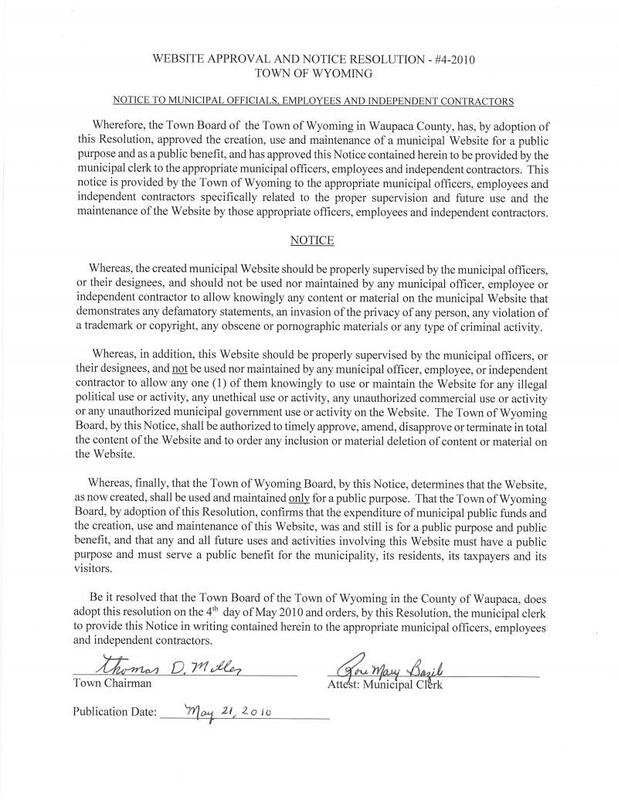 The Website for the Town of Wyoming in Waupaca County is not intended by this municipality to be a source for legal or professional advice. Visitors to this Website should always seek the advice of an appropriately qualified professional. This Website assumes no responsibility for information contained on this Website and disclaims all civil or criminal liability in respect of such information. In addition, none of the content in this Website will form any part of any contract or agreement between the municipality and any user, or constitute any type of offer by this municipality to any person. Specific disclaimers may apply in addition to certain content or parts of this Website. This municipality accepts no responsibility for and excludes all civil or criminal liability in connection with any user browsing this Website and for the user using the information or downloading any materials from it, including, but not limited to, any liability for errors, inaccuracies, omissions or misleading or defamatory statements. The information at this Website might include opinions or view, which, unless expressly stated otherwise, are not necessarily those of this municipality, any municipality, any municipal officers, employees or any other person(s)in relation to this municipality who would have any potential liability or responsibility. This Website is provided to users "as is" and this municipality expressly disclaims any and all representations or warranties, express or implied, to the extent permitted by law, including but not limited to, warranties of satisfactory quality, merchantability, fitness for a particular purpose, non-infringement of third party rights or the presence of any computer virus with respect to the Website service or any materials or content herein. This municipality hereby expressly excludes itself from liability for any claims, losses, demands or damages of any kind whatsoever with regard to any information content or services provided at this Website, including, but not limited to, direct, indirect, incidental or consequential loss or damages, compensatory damages, loss of profits or data, or otherwise. Any user of this Website agrees to defend, indemnify and hold this municipality, its officers, employees and agents, including independent contractors and its assigns harmless from any claims, damages or costs, including attorney fees, arising from or as a result by the user of the use of this Website. The user of this Website does waive, on behalf of the user and the heirs, personal representatives and assigns of the user, any and all claims, actions or cause of action of whatever source or sort against the municipality, its officers, its employees, agents, including independent contractors, and its assigns, from the use of this Website by the user and all the content submitted or received from this Website. The user further consents here to release by the municipality, pursuant to any public record request, any communication or information which the user supplied to the City through this Website, which is not otherwise specifically prohibited from discussion, pursuant to Wisconsin law. These Website pages and all files on this Website are copyrighted by this municipality. The fair use guidelines of the US copyright statutes apply to this Website material. Any use of these Website pages and files outside the fair use provisions require expressed written permission of this municipality. Permission is to be obtained by written request to the municipal clerk. Links to external or third party Websites are provided solely for user convenience. Links taken to other sites are done so at the risk of the user and the municipality accepts no liability for any linked sites or their content. When any user obtains access to an external Website from this Website, the user must keep in mind that this municipality has no control over the content of that Website. Any link from this Website to an external Website does not imply or mean that the municipality endorses or accepts any responsibility for the content or the use of such third party Website. This municipality does not give any representation or warranty regarding the quality, safety, suitability or reliability of any external Websites or any of the content or materials contained in them. It is important for users to take necessary precautions, especially safety from viruses, worms and other potentially destructive items as a result of any link to these third party Websites. The municipality, by its officers, employees and agents, including independent contractors and its assigns, seeks to ensure that all content and information published at this Website is current and accurate. The information at the Website does not in any way constitute legal or professional advice and this municipality cannot be held liable for actions arising from its use. In addition, this municipality cannot be held responsible for the contents and information of any externally linked third party Website or pages. When any user of this Website visits this Website via the Internet, no personally identifiable information is obtained by this municipality except as noted herein, about the user unless the user then will contact this municipality by e-mail, facsimile or other written communication regarding any concerns or questions about the Website. Any such written communications received by this municipality will be considered a public record by the municipality and subject to Wisconsin Law. If this municipality, by any use, desires to complete any survey by this Website, this municipality will disclose what personal information will be sought and obtained from the survey participants for the municipality and how it will be made public by this municipality. This municipality, as its operation policy, reserves the right to terminate at anytime this Website or to add, amend or delete the contents or format at any time by direction of the proper municipal authorities or their designees. Security. Because this Website does not encrypt incoming e-mail, you should not send information that you consider highly sensitive through this Website. The municipality may use software programs to monitor network traffic to identify unauthorized attempts to upload or change information, or otherwise cause damage. Except for authorized law enforcement investigations, no attempts are made to identify individual users or their usage habits.